We all know that Kolkata is a city that loves books, a fact most evident in the number of specialty bookstores that thrive here despite all the big chain stores. 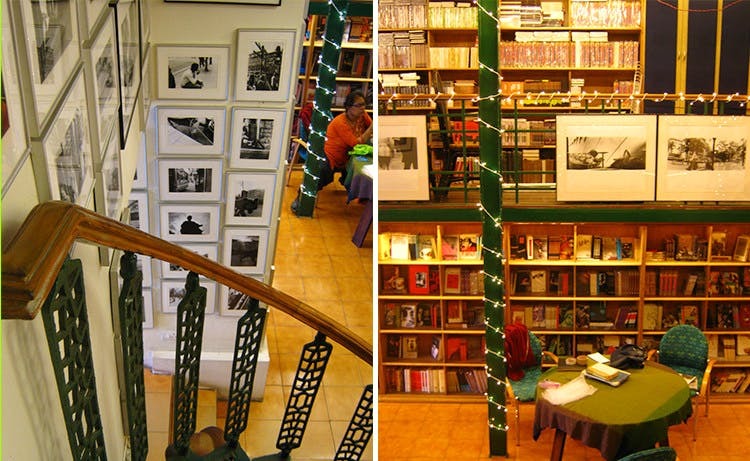 We’ve compiled a list of some great indie book havens in the city – because Amazon’s recommendations have got nothing on a face-to-face chat with the well-informed booksellers of Kolkata! Some are stories unto themselves. This seemingly tiny bookstore on Middleton Street is a Kolkata gem. It has one of the best collections of Indian writing in English (best for those who want to avoid gimmicky writing by Chetan Bhagat and Rajvinder Singh!). The books here have narratives from different walks of life, from issues ranging about feminism, environmental activism and Dalit rights. They also have some lovely children’s books illustrated by some of the world’s best illustrators. You can also find a collection of really kitschy, graphic work such as our personal favourite, Matchbook by Shahid Datawala and V Geetha, which is basically a visual guide to Indian matchbox labels! Sometimes they have really interesting events in the small area, made with bamboo above the store. Check if co-owner Vinita Mansata (in photo) is in the store. She will be the perfect guide to what to pick up from the store and it’s always great to have a conversation with her about the city, life, philosophy, environmental issues – generally everything under the sun. If you’re looking for something which balances out academic work with a healthy dose of fiction, and a store that gives you a vast range of narratives to choose from, Earthcare is definitely the store for you. Pro Tip: Look out for the range of diaries (the ones with kalamkari covers are must-haves), black-and-white postcards and framed photos of Kolkata by an Irish photographer and quilted, kantha work bags. With sculptures placed at the gate, photographs and minimalist paintings on its walls, this store in Bhawanipur is probably one of the most aesthetically pleasing stores in the city. However, there are better reasons to visit this store than its décor. It sells English translations of European literature which are published by Seagull India. The book covers are lovely collages and montages of photographs, mostly done by in-house designer Sunandini Banerjee. They have many books about the works of directors like Mrinal Sen and Ghatak, academic works by Gayatri Chakravarty Spivak. They have translations of authors like Chinese Nobel Prize winner Mo Yan, Tariq Ali, Picasso, Max Frisch and many others. Pro Tip: They also sell some limited edition notebooks which is one of those must-have pieces of stationery anyone would be lucky to have. When you enter College Street, look out for the alley next to the Calcutta Medical College which is filled with roadside vendors who have some pretty incredible books for sale. From German photography magazines dating back to the 1980s, to some very rare editions of classics and modern philosophers, these stalls are always a pleasant surprise for anyone looking to stumble upon writings about different cultures, art and fiction that is very difficult to find anywhere. The fact that these come so cheap is also a big bonus. Pro Tip: You will have to be patient and spend time browsing around quite a bit. In all honesty, the collection at this store isn’t what it used to be. But with new sections developing like the French books handpicked by the French Book Office, and an extensive collection of European writers, this 1920s bookstore continues to be intrinsically linked to the city. We can spend hours in this store, browsing through the art and photography books. These are the gems one visits Oxford for along with the much needed dose of nostalgia to get through this city when things aren’t going too well. Pro Tip: After buying and browsing, head over to the Cha Bar upstairs, which is a super cosy place to grab a sandwich or tea (they have the largest collection including a stinky Japanese fermented one!) and read your latest purchase. Next time you’re visiting Sudder Street or New Market, cut down on the clothes and food shopping and visit this store. They are one of the oldest dealers of both secondhand and new books on Free School Street. If you couldn’t find a book in the previously-mentioned shops, there’s a chance you might find it here. The gate of the shop proudly showcases the entire Tintin and Asterix collection which is sold at half the price, and the books look brand new! Pro Tip: If you go through all the shelves and figure out the cataloging, you might find many Daphne du Mauriers (the rarer books), some great crime pulp fiction classics, and even some classic erotica hidden in some corners. Located on the Jawaharlal Nehru Road footpath near Grand Hotel, this store is very easy to miss. If you know what you’re looking for, you’ll find some great books on sociology, film studies, literary criticism and many other technical subjects. For all of you college students struggling to find those last minute notes or struggling to make sense of course work, this store might be worth a visit. You never know what you might find! Pro Tip: They can also order hard-to-find books for you. So come armed with a wishlist. Located above the famous College Street Coffee House, this Bengali bookstore at the hub of the College Street boi para has wonderful comic versions of Satyajit Ray’s Feluda, with panels illustrated in watercolours. Apart from this, you can find lovely books about art in Shantiniketan, Bengali translations of books by Jhumpa Lahiri, old classics like Chander Pahar with original woodcut illustrations, children’s books and recipe books. If you’re looking for some interesting books about the city and its fiction, head here. You don’t need to be able to read Bangla to enjoy these comics and art books. Pro Tip: They have an excellent scheme wherein you get free books with a purchase. Ask at the counter. A range of secondhand book stores line the Golpark area. On a good day, you can stumble across some absolute treasures – like a copy of Anais Nin’s journals, or Penguin Paperbacks of authors like Aldous Huxley and H.G. Wells (for INR 40), and their science fiction collection can be quite rewarding. You also get Taschen’s art books about Miro, Lempicka and some really interesting books about Indian art, catalogues from past exhibitions. Pro Tip: You have to come with time in hand, patience, and bargaining skills. Some of the books you can pick up from here for INR 100 will be over INR 2,000 elsewhere. You also get newer bestsellers for much less than the MRP!